Could insecticide sprays cause Parkinson's disease & brain tumors? There is a growing body of evidence linking pesticide exposure to Parkinson’s disease and brain tumors. 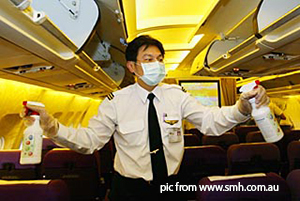 A number of retired flight attendants claim that forced exposure to insecticide sprays inside aircraft may have caused them to develop Parkinson’s disease, and they plan on taking this matter to court. Some experts have warned that anyone who regularly takes international flights and has been exposed to insecticide spraying upon landing faces the same risk. Parkinson’s disease is an absolutely devastating condition that can leave the sufferer immobile, speechless and with shaking, rigidity or tremors. It occurs when cells in the brain that produce dopamine are destroyed. There are drug treatments available but they usually have terrible side effects. In severe cases Parkinson’s disease can be fatal. The link between Parkinson’s disease and insecticides/pesticides has been known for some time. Farm workers are particularly at risk. I’ve seen several patients over the years who have grown up on banana farms, who mentioned to me that nearly all of their relatives end up developing Parkinson’s disease. We don’t have complete control over the air we breathe and the chemicals we’re exposed to, but at least we have some control over the food we eat. Try to eat organic food as much as possible; try to grow some of your own vegetables (even if it’s just parsley in a pot); and support the health of your liver so it is better able to detoxify your body of harmful chemicals.